1) Do I need an acount to place an order ? Use menu to choose your accessories. You can also shop by browsing "SELECT STYLE" - section below. If you have found an item, select your size and use the 'ADD TO CART' button. 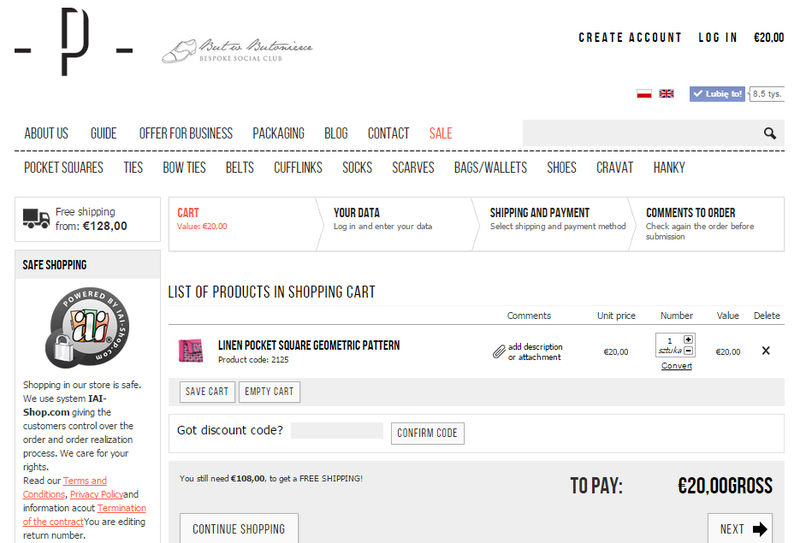 Review the items in your shopping bag by selecting the cost of basket at the top of the page. You can delete items from your shopping bag. In this step you can use your discount code. If you have forgotten your password follow the 'Forgotten Password' instructions on the 'Create account' page. We accept MasterCard, Visa, American Express, Diners Card, Discover Card. You can pay with PayPal. When selecting this option at checkout, you will be directed to the PayPal site to 'Log In' and review the amount shown before clicking 'Pay Now'. Once this transaction is complete, you will then return to our shop. Payment is only debited from your card at time of dispatch. We use the SSL encryption technology to store and safely transmit your personal and credit card information through our systems. We are shipping to Europe and your order will be charged in Euros. Taxes (VAT) are included in the price you pay and no further payment of tax can be due in any other EU country. This encrypts and protects the data you send to us over the internet. If SSL is enabled then you will see a padlock at the top of your browser and you can click on this to find out information about the SSL digital certificate registration. 9) How do I return or exchange my order? You have 14 days to decide whether to keep your items. Simply request a returns from your account and then book a collection to send your item(s) back to us. Your refund will either be issued to the original payment method used to place the order or as store credit.